Dowran, B. (2014). An analysis of the qualitative research conducted by Iranian psychologists: A systematic review. International Journal of Behavioral Sciences, 8(3), 227-232. Behnaz Dowran. "An analysis of the qualitative research conducted by Iranian psychologists: A systematic review". International Journal of Behavioral Sciences, 8, 3, 2014, 227-232. Dowran, B. (2014). 'An analysis of the qualitative research conducted by Iranian psychologists: A systematic review', International Journal of Behavioral Sciences, 8(3), pp. 227-232. Dowran, B. An analysis of the qualitative research conducted by Iranian psychologists: A systematic review. International Journal of Behavioral Sciences, 2014; 8(3): 227-232. Introduction: In recent years researchers in human science have been interested in qualitative researches. Considering the qualitative research capabilities and its potential role in the development of psychology, this study evaluated the qualitative research conducted by Iranian psychologists.Method: The present study is a systematic review. 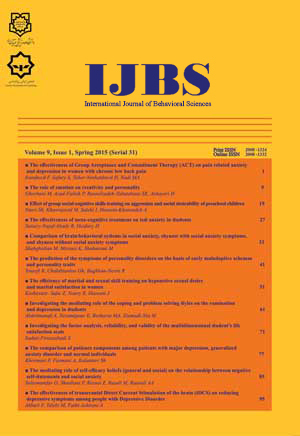 By Searching the Internet websites of Scientific Information Database (SID), Noormags, Magiran and Ensani, 21 articles in the subject of psychology, which had been conducted by Iranian psychologists, were identified and evaluated.Results: The findings reveal that few details on methodologies and the research processes have been presented and in some cases, applying the qualitative method was not appropriate for the research questions. The phenomenological and the interview method have been mostly used.Conclusion: Although more than a decade has passed since the publication of the first qualitative study by Iranian psychologists, the number of articles with a qualitative approach and their quality are poor. Due to the role of this approach on the production and the development of psychology, it is expected that qualitative research will find its actual and desired position among researchers in psychology.